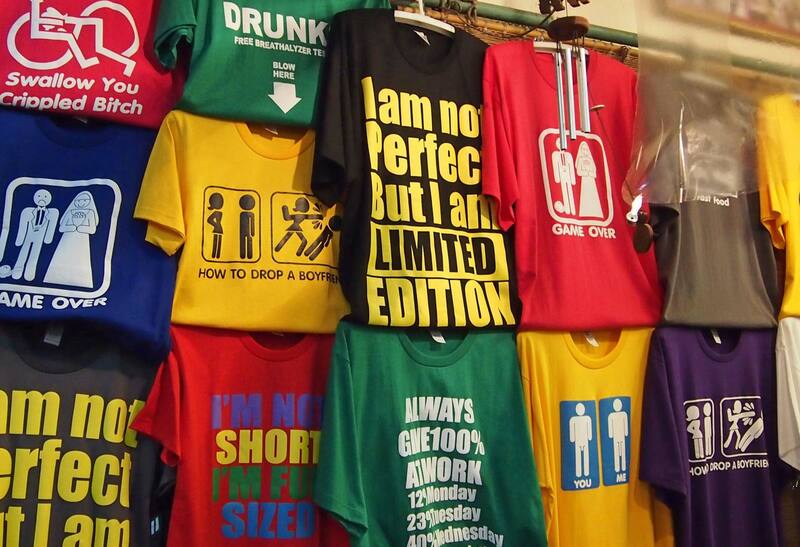 I’d heard that Bangkok has a thriving local fashion scene, especially in the case of T-shirts, my standard daily uniform. So I set off to find some “Ooh, I love your shirt, it’s so unique, can I give you my phone number” inspiring designs, as well as some unique Ts to serve as prezzies for family and friends. On the advice of friends, I decided to visit Khao San Road, MBK Center and the night market along Silom road. I skipped Chatuchak Weekend Market – it’s an experience in itself, so we’ll save that for another time! Khao San Road, what used to be the exclusive haunt of bedraggled backpackers, has transformed into a trendy area of clubs, bars and boutiques while maintaining a grungy appeal. It’s a great shopping experience but it’s also an ultimate people-watching venue (think human zoo), where you’re bound to see many a bronzed and beautiful bombshell. T-shirt stalls line the streets of the Khao San area. There’s a decidedly hippy feeling in the air, and it’s reflected in the T-shirt designs: tasteful and artistic Buddhist and Asian imagery printed on light cotton shirts. My favorites included a powder-blue ornamental koi fish swirling across my chest, and a bright Ganesh print. They set me back 270 baht each (around $9). Another favorite was a T with the Sanskrit writing that many Thai men have tattooed over their bodies for protection and strength. I don’t consider myself a softy, but as soon as I donned the shirt, I felt substantially stronger (and decidedly more butch to boot!). From a selection of colorful shirts sporting local beer and drinks brands, my favorites were a bright red print of the local Singha soda brand, and a boxing match between a can of Chang beer and a can of Singha beer. Most T-shirts are made of good quality cotton and range in price from 180 – 450 baht ($6 – $15, depending on your bargaining power). On the way to the next stop, the famous Mahboonkrong, or MBK Shopping Center, I wanted to pass through Siam Center. Unfortunately, it’s closed for renovations until December 2012. After December, I recommend a visit as it has many small boutiques featuring local designers. Jay Emanuel of America’s Next Top Model was seen sporting a design from this venue’s Theatre boutique. MBK is a must-visit – a bargain hunter’s paradise with extensive electronics sections and floors and floors of clothing. While many of the shirts are copies of international brands, on the 4th floor you’ll find shops full of souvenir and joke t-shirts at ridiculous prices (99 baht, or just over $3). Great gift ideas for nieces, nephews and ex-boyfriends. T choices: every conceivable way of placing an elephant onto a shirt, tuktuks, wats and the Thai alphabet. Sounds tacky, but there are many conversation starters that could get you a phone number or two. The-printed-word Ts: need help coming out? Consider the “Sorry Girls, I’m Gay”. Help a friend come out and get yourself the “I think he’s gay (arrow left)”. Smile inducers include the Dead Bull, Star*ucks, “Tonight I am single”, “No Money, No Honey”… you get the drift. Finally, Silom night market, with its boundless range of T prints. Near Soi 2, find Ts bedecked in real Swarovski crystals. A little too bling for my liking, but I’m told they’re a hit in Ibiza. They even take your own design for personalized bling. In Soi 4, Body Talk offers a selection of figure-hugging tanks and Ts sporting dragons, a number or the word “Gym.” Go figure.